With the fourth poll in my 2016 CFB/FBS weekly rankings, Alabama has finally secured the Number 1 spot for now. Four polls, four new Number 1’s. Of the Number 1’s CFB/FBS programs I have ranked weekly, either have dropped from the Number 1 spot due to loss or Did Not Play (DNP). Both Louisville and Tennessee were dropped from the Number 1 ranked spot due to losses. However, Michigan drops out of the Number 1 spot due to the fact that they were on a bye week and could not increase thier win total, but are still ranked fourth (4th). There are valid arguments to be made for those CFB/FBS programs I have ranked 1 through 3, to be ranked at the top of my weekly poll. Clemson (ACC) and Western Michigan (MAC) could also be ranked Number 1 this week, but since they already played a FCS schools, I hold that against them in the rankings since FCS schools are not eligible to compete for the $50 Million dollars at stake on the table or are classified as an FBS school for football. It’s like the NY Yankees playing their farm club and receiving credit for automatic wins. Since Alabama does not play their FCS opponent until later, they will stay at Number 1 until that point or loses. However, Clemson possesses a better Opponent Win-Loss percentage and Conference Opponent Win-Loss percentage over both Alabama (SEC) and Western Michigan (MAC). So there are VALID and measurable variables to support Clemson being ranked Number 1 in my poll. With that said; Alabama, Clemson and Western Michigan all (7-0) could be ranked 1 through 3, in three different ways depending on the variables used. Here is this weeks rankings. My rankings possesses more validity and credibility in ranking FBS programs 1 through 25 because I examine, evaluate and assess variables that the USA Today Coaches, the AP Press Voters, the “expert” ESPN media members and CFP committee fail to review or accept as valid rankings variables. These voters, media members and committee members use the eye test or vested interest to rank CFB/FBS programs 1 through 25. If you review my rankings this week, I have all FBS conferences ranked within my Top 25, except Conference USA (CUSA). I hold no bias or favortism, numbers and data do not lie. Now the 2016 FBS season starts to get more interesting with many menaingful scheduled games to be played. We are now down to 11 (0) loss programs and 9 (1) loss FBS programs still standing in college football. At the half mile pole of the CFB/FBS 2016 season, I wonder what the next poll will show? Will we lose any more (0) loss teams and will more (1) loss teams become (2) loss teams. Let the remaining games of the 2016 FBS/CFB season be entertaining and un-predictable. I look forward to the outcomes of those games scheduled. Please share with your college football friends and family. This 2016 college football season has seen some very interesting games and outcomes. Expectations of who were perceived as the best FBS teams when the pre season polls were released, but reality does rear its head as the season plays out. Last weeks Number 1; Tennessee fell to a very good Texas A&M team who could end up beating Alabama in a few weeks. There are surprises in this weesk Top 25 poll with the Washington Huskies, Western Michigan, Navy and Troy being in the Top 25. In the next few weeks I will add reasons and data points on why certain FBS programs are ranked the way I have ranked them. Within two weeks, our 0-loss program numbers have dwindled down to just 11 now, from 23. Of those 11 remaining 0-loss programs, we could see only 1 zero loss program left standing at the end of the FBS season, prior to the bowl games and conference championship games. Who will that 1 program be, I have my thoughts but I will let the season play out. Here my weekly Top 25 rankings for college football at the FBS level. This Top 25 in which I have ranked, possesses no vested interest in who is ranked and or where they are ranked. My objetcive is to get it right and make sure those FBS programs who need to be ranked in the other public and published polls receive notoriety and due recognition for thier success. All FBS CFB programs are equal. Please share this post with all your friends and college football fans across the country. There were some position movements within this next poll from the first poll last week. Last weeks number 1, Louisville Cardinals loss to Clemson Saturday, dropped out of the top spot in my poll. As the CFB season progresses there with many key match-ups on the remaining schedule, which of the remaining 16 0-loss FBS programs will remain at the end of the season. My prediction on that will be 2, 0-loss prorgams remaining at the end of the 2016 CFB season. Many of you will wonder why I do not have Alabama ranked Number 1 in my poll. I use different variables which are measurable and accountable against your current season, in addition to what research proves on those specific variables. The media, coaches and CFP committee use their own variables which does posses vested interests in how they rank the FBS programs. I have no vested interests or a stake with the $50 Million Dollars, the trophy or the right to be called national champion at the FBS level. I possess a more Stuart Mills like approach. As the CFB season concludes, I will explain how I rank and what variables I use to support a more accurate ranking of the CFB porgrams without subjective assessment from the Sports Media and Coaches who have vested interest. With the NCAA College Football 2016 FBS season underway with 4-weeks in, we now can start to formulate and assess the first weekly rankings based upon many variables. The varaible I use to rank my Top 25 starts with wins-losses, looks at the non-conference scheduling practices, was an FCS game already played and the current overall record of the opponents already played. Here are some interesting facts that are current about this 2016 FBS season. As of right now there are 27 zero (0) loss programs, and 28 one (1) loss programs. its hard to rank one through twenty five, but using the measurable variables that I do. I have made some adustments to my ranking and assessment system. This weeks rankings are as follows with no favortism or subjectve bias. Since it’s early in the 2016 FBS season, I will rank (1) through (27). How this ranking breaksdown is; (6) Big 10, (4) ACC, (4) PAC 12, (3) AAC, (3) PAC 12, (3) MWC, (3) SEC (2) Big 12, and (2) MAC. So far well balanced. To answer the “experts” questions of which conference is the best conference, the rankings tell the tale. Numbers and data do not lie. These 2016 CFB FBS rankings will appear weekly. Please share these rankings with any media personnel you may know or yoru college football friends. During the coursse of my research of 8 years, I have been selecting a mock expanded college football playoff bracket which includes a field of 16. I have selected and seeded the mock field of 16 from the 1996 thourgh 2015 FBS seasons. The criteria I used is based on the professional model theory, plus other categorical variables which are quantitative, measureable and eye tests is omitted. The eye test is purely subjective and possesses no true validity in ranking criteria. This group of 16 FBS programs has earned their spots. The seeding process is based upon multiple variables plus the professional model theory. There is no one in the room with me when I seed and select. Biases are set aside and each of these FBS teams that are ranked at this level are given fair, just and equal consideration. That’s the way it should be. Remember the criteria I use is that those FBS teams seeded one (1) through eight (8) host the first round games in their stadiums and ome sites. They earned their home field advantage playoff game. This field of sixteen (16) is comprised of thirteen (13) Power 5 members and three (3) Group of 5 members. This system offers ALL 128 FBS members opportunity to compete for the FBS NCAA National Championship. The current and past system is not fair to all 128 FBS members. #1 Clemson (12-0) overall, (67-64) vs. scheduled opponents combined records (2-0) vs. ranked in Top 16, (0-0) vs. seeded above them, 1 FCS Game and 1 Away Non Conf. Games. #2 Iowa (12-0) overall, (57-75) vs. scheduled opponents combined records, (1-0) vs. ranked T16, (0-0) vs. seeded above them, 1 FCS Game and 1 Away Non Conf. Games. #3 Oklahoma (11-1) overall, (76-64) vs. scheduled opponents combined records, (3-0) vs. ranked in T16, (0-0) vs. seeded above them, 0 FCS Game, and 1 Away Non Conf. Games. #4 Michigan State (11-1) overall, (70-61) vs. scheduled opponents combined records, (1-0) vs. ranked in T16, (0-0) vs. seeded above them, 0 FCS Game, and 1 Away Non Conf Games. #5 Ohio State (11-1) overall, (73-71) vs. scheduled opponents combined records, (0-1) vs. ranked in T16, (0-1) vs. seeded above them, 0 FCS Game and 1 Away Non-Conf. Games. #6 Houston (11-1) overall, (56-74) vs. scheduled opponents combined records, (1-0) vs. ranked in T16, (0-0) vs. seeded above them, 1 FCS Game and 1 Away Non Conf. Games. #8 North Carolina (11-1) overall, (54-66) vs. scheduled opponents combined records, (0-0) vs. ranked in T16, (0-0) vs. seeded above them, 2 FCS Games and 0 Away Non Conf. Games. #9 Stanford (10-2) overall, (70-63) vs. scheduled opponents combined records, (1-1) vs. ranked in T16, (0-0) vs. seeded above them, 0 FCS Game and 1 Away Non-Conf. Games. #10 Notre Dame (10-2) overall, (77-65) vs. scheduled opponents combined records, (1-2) vs ranked in T16, (0-2) vs. seeded above them, 0 FCS Game, and 2 Away Non-Conf. Games. #11 Florida (10-2) overall, (76-66) vs. scheduled opponents combined records, (0-1) vs. ranked in T16, (0-1) vs.seeded above them, 0 FCS Game, and 0 Away Non-Conf. Games. #12 Temple (10-2) overall, (62-82) vs. scheduled opponents combined records, (0-1) vs. ranked in T16, (0-1) vs. seeded above them, o FCS Game, and 2 Away Non-Conf. Games. #13 Western Kentucky (10-2) overall, (64-79) vs. scheduled opponents combined records, (0-0) vs. ranked in T16, (0-0) vs. seeded above them, 0 FCS Game and 3 Away Non-Conf. Games. #14 Northwestern (10-2) overall, (74-58) vs. scheduled opponents combined records, (0-1) vs. ranked in T16, (0-1) vs. seeded above them, 1 FCS Game and 1 Away Non-Conf. Game. #15 Florida State (10-2)overall, (68-64) vs. scheduled opponents combined records, (1-1) vs. ranked in T16, (1-1) vs. seeded above them, 1 FCS Game and 1 Away Non-Conf. Game. #16 Oklahoma State (10-2) overall, (68-64) vs. scheduled oppenents combined records, (0-1) vs. ranked in T16, (0-1) vs. seeded above them, 1 FCS Game and 1 Away Non-Conf. Game. Appalachian State (10-2) overall, (61-72) vs. scheduled opponents combined records, (0-1) vs. ranked in T16, (0-1) vs. seeded above them, 1 FCS Game and 2 Away Non-Conf. Games. Navy (10-2) overall, (70-61) vs. scheduled opponents combined records, (0-2) vs. ranked in T16, (0-2) vs. seeded above them, 1 FCS Game and 1 Away Non-Conf. Game. TCU (10-2) overall, (65-67) vs. scheduled opponents combined records, (0-2) vs. ranked in T16, (0-2) vs. seeded above them, 1 FCS Game and 1 Away Non-Conf. Game. Toledo (9-2) overall, (60-72) vs. scheduled opponents combined records, (0-0) vs ranked in T16,(0-0) vs. seeded above them, 0 FCS Game and 0 Away Non-Conf. Game. Overall Record- Final record after the regular season is completed. Conference Championship Games DO NOT COUNT. Only 10.6% of the FBS pool play a 13th game to be evaluated by. VS. Scheduled Opponents- The combined records of the scheduled games on thier FBS Schedule minus (-) any FCS game. FCS program records DO NOT COUNT. FCS is not eligible for the FBS playoffs. VS. Ranked in Top 16- The record versus those FBS programs ranked in my Top 16. VS. Seeded Above Them- The record versus those FBS teams already seeded in my field of 16 above your seeded position. FCS Games- Number of FCS games scheduled during the regular season. These games count overall but held against the FBS program since they should be scheduling FBS programs. Away Non-Conference Games-Number of Non-Conference Games that were scheduled during the regular season, excluding neutral site games since their is regional home field advantage. The greater the number of Away games scheduled, the greater the risk and reward if you win on the road away from home. It’s interesting that it takes a committee of twelve (12) to select what they beleive is the best four (4) and I can select a field of sixteen (16) which is fair, just and offers all 128 FBS programs equal opportunity to compete for the national championship. Thus making the statement of being called a true national champion for college football and the financial revenue that comes with that prestiguous honor. You don’t need a committee, your don’t need subjectivity and the Power Brokers and their conference members don’t need to have total access to the $50 Million dollar prize. To the sports media, If you use any of my postings for your own in comments within your publishings or articles or posts, this includes use of radio and television broadcast’ please use the APA/MLA format and cite the the source. There are many questions that arise from the college football fans and media, when college football programs from the FBS level schedule FCS programs. The FCS is the next division down in classification at the NCAA level of college athletics from the FBS level for college football. Do you ever wonder why FBS programs schedule FCS programs? Then in return, receive credibility for a lopsided victory that posseses a 90%+ chance of winning versus lower level classification competition. Credibilty means adding an automatic win to the win column, increasing statistical data to personal athletic particpation, an increased credibility ranking within the subjective polls and the CFP committee. What is the purpose of scheduling these types of games? Is it money? An easy win? Or is it fear of scheduling a competitve FBS opponent that could result in a loss and possess a negative effect on ranking while competing for bowl eligibility or more importantly excluded from the CFP four-team playoff. Written below is statistcial information and explains the FBS scheduling FCS debate, that ESPN and thier weak reporting staff fails to report or wish not to investigate. The data is accurate, factual and paints he picture. Care to debate the results? 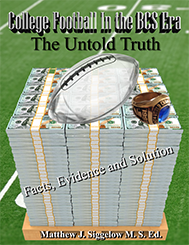 In my book “College Football in the BCS Era,The Untold Truth: Analysis of Facts that Supports the 16-Team Playoff Model”, I authored and dedicated a chapter specifically on the FBS/FCS scheduling from 1996 through 2013. Within this chapter, I clearly explained and defined the statistical evidence that supports that the FBS/FCS scheduling serves no purpose. What the statistical evidence reports is that on average, the FBS teams will win 89.8% of the time and win by 4-plus possessions or more. A possession is considered as scoring a touchdown and the extra point. During the 2015 FBS season, the results have not changed at all, in fact the win loss success rate went up almost one (1) full percentatge point to 90.6%. The FBS win-loss record versus the FCS was (96-10) this 2015 FBS season. Of those (96) wins by FBS programs, (76) were lopsided wins by 3 possessions or more. Which means the FBS programs won by equal too or greater than 21 points in the game. The total points scored this 2015 FBS season for the FBS programs against the FCS totaled (4807), with a scoring points per game average of (45.3) per game. The total points scored this 2015 FBS season by the FCS programs totaled (1548), with a scoring points per game average of (14.6) per game. The average scoring difference per game between the FBS and FCS was (30.7) points per game. That is a significant increase of (5.3) points more per game by the FBS over the FCS, in comparison to the research I already performed with the historical point difference from 1996 through 2013. Again, I ask what is the purpose of playing or scheduling these games if there is NO negative effect against FBS programs either ranked or un-ranked during the course of the FBS college football season. The table below shows the win-loss records, total points scored and against with scoring average for each FBS Conference this 2015 FBS season. A note about this data and table: Toledo and LSU scheduled FCS games but did not play them this season. They could have played each other. Hmmm an intersting thought. Here is an intersting thought. For example that best exemplaifies the lack of consistency between the subjective polls and the very inexperienced CFP committee. When Alabama played last week versus FCS Charleston Southern at home and wins, but failed to not drop in the subjective rankings or the CFP poll. However, Notre Dame plays FBS opponent Boston College on the road and wins but drops 2 spots in the CFP rankings but in the AP and Coaches Polls they climb one (1) spot. Seems there is a discrepency within consistancey in how to rank week to week and what the EXACT criteria is for the CFP committee in how to rank. Ranking criteria changes week to week wirth the CFP committee. So which or who is right? Give credit and increased ranking to a FBS program that we know is going to win versus a lower classification opponent, but decrease the credibility of an FBS program with a win versus a same level classification on the road. Seems that the CFP committee lacks a true criterial ranking process, lacks education knowledge on how to rank properly and giving credit when credit is earned not given. The CFP committee may have titles attached to thier names such as Athletic Director, Head Coach, Liuetenant, General, Executive Director of NCAA, State Senator, University Professor, Secretary of State, Commissioner of a Conference, or Writer of a newspaper; they all have an egenda on who the four (4) FBS teams will be to compete for $50+ million dollars. That egenda is selecting the right four FBS programs who have earned the spot for the CFP playoff, giving all 128 FBS programs fair, equal and just due diligence in ranking and not ranking based upon conference affiliation or categorical assignment of Power 5 or Group of 5. All 128 FBS prorams are classified as FBS for a reason, compete under the same NCAA logo, rules and pay the same membership fees as everyone else. The committee lacks the proper knowledge of how FCS scheudling has NO negative effect in rankings. The committee need to know all metircs to determine which are the best FBS programs not pick and choose the metrics they want to use. Time for the CFP committee to either educate up or in need of a new CFP committee that will use all metics in the selction process. I do believe I have the CFP committee figured out this time. Honest. Last week I was 96% correct in selecting the field of 25, missing out in USC and Oregeon. I was only correct on four (4) placement accuracies that only 16% for the accuracy rating and ten (10) we will call near misses. A near miss would be defined as having selected the right FBS team in the rankings or in the field but missing their accurate ranking by one placement. That makes my near miss accuracy rate then at 40%. It seems that I can select the same group as the CFP committee, but we have different criteria to rank the FBS programs in order when they win or lose. I know the CFP committee has a tough job in this process with teams they thought would win but lose, and teams that are predicted to win by large amounts only win by one (1) possession or escape in overtime. With that said, this past week seven (7) FBS teams ranked in the CFP poll lost; Houston, LSU, Memphis, Ohio State, Oklahoma State, USC, Utah and Wisconsin. What this means is my research on rnking systems and experience comes into play here. What my intution and research tells me is that LSU, Memphis, USC and Wisconsin WILL drop from the CFP rankings. The other FBS programs that lost Ohio State and Oklahoma State will or should remain in the Top 10 or even the top 12. Utah will drop to the 20th ranking position, with Houston and TCU, they might hang on to stay in the last 2 spots of the CFP rankings. With so many ranked FBS teams losing, I do believe that the CFP committee fails to recognize all the FBS members who are having great seasons this year. However, the CFP committee only reviews those FBS programs from the Power 5 or the BCS conferences before ranking any of the Group of 5 or Non BCS programs when needing to complete the bottom half of the Top 25 rankings. For example from the Conference USA there are Marshall and Western Kentucky who are both (9-2) along with Louisana Tech and Southern Mississippi both at (8-3). From the Sun Belt Conference there is FCS newcomber to the FBS level Appalachian State at (8-2). From the Mountain West Conference there are Air Force and San Diego State both at (8-3). From the Mid American Conference Northern Illinois and Bowling Green both at (8-3). And finally BYU who is Independent at (8-3). This excludes the American Athletic Conference, since they have had a great season and representation already. That’s ten (10) Group of 5 FBS members how are not receiving an sniff from the CFP committee to at least rank them. However, the CFP committee must rank Power 5 FBS programs first if they are (8-3) or (9-2) over any Group of 5 FBS menber. That in itself is an un-written rule that the CFP committee or sports media wont mention. I will expand on this later and have expaned on it my book that will be re-released next year. Now to my weekly CFP committee projections or predictions. Remember this is a prediction on how I believe that the very in-experienced CFP committee will rank the FBS programs one (1) through twenty-five (25) weekly. With one more true and final week of the college football season to go, this final week is going to be intense and amazing. There are scenarios I am rooting for this week. Those being Alabama losing to Auburn and Florida losing to Florida State. I am also rooting for all other FBS programs to win the games they need to, to stay above the SEC. Those loses by Alabama and Florida would mean that every SEC team would have two(2) losses or more and puts the committee in un-familiar territory. How do we have a playoff without an SEC team representing? That wil be the true test of the CFP committee and if they do select a two (2) loss SEC team for the playoffs, then there will be screaming shouting and lawsuits. WE shall see how this turns out. This past weekend of college football was very precitible, entertaining and lots of games that made the weekend full of excitement. After Ohio State and Oklahoma State losses this past wekeend, it allowed Clemson and Iowa to move into the top two (2) spots. Interesting Iowa has not been getting the ranking they deserve but remain as a 0-loss FBS program. Clemson and Iowa are both (11-0) heading into this weeks final games for them and could maintain as the only two (2) 0-loss FBS prorgams. This is what my research proved, that during the course of the college football season that on average only 2.5 FBS teams will remain un-beaten or as 0-loss programs. You cannot say Clemson and Iowa have not earned the top spots this season to this point in time. As for the rest of the FBS programs, those with 0-losses earned their first loss. With Clemson and Iowa at (11-0), thay have already secured a spot in my field of 16 mock playoff system. With 14 spots remaining which of the remaining twelve (12) 1-loss teams will earn their spot and which of those 1-loss teams will be dropped to the 2-loss group. My research proved that all 1-loss FBS programs would earn a spot in the field of 16 in my mock playoff brackets. Now the ultimate question is, which of the 2-loss programs will stay at two (2) losses to be evaluated for the remaning spots after all the 0-loss and 1-loss teams are seeded? Now the most interesting moments of this past weekends college football season was the struggles that the Southeastern Conference (SEC) had with the Sun Belt, Conference USA and an FCS program. The upset of the week goes to the Academy at Citadel for beating South Carolina 23-22. Then to add to that, Florida (9-1) struggles with (2-8) Florida Atlantic, needing overtime to squeak the victory away from them 20-14. Speaking of overtime, Georgia (7-3) needed overtime to squeak by Georgia Southern (7-2) 23-17. To add to those three (3) games, Auburn (5-5) needed to play a stronger second half to pull away from Idaho (3-7) 55-34. Seems to me that the SEC has lost its dominance, but the voters and CFP commiteee just does not see it that way. The SEC does have a media and CFP committee bias. They wont admit it, but its clearly evident. The rankings this week showed many changes since the weekend created many losses with FBS teams that you thought would win, but did not. Tell me ESPN, how is that FPI rating system working for you? In time studies and research will be performed on that provings it not a viable or credible metric or data point to rank FBS football programs. As the season progressed the cream usually rises to the top of the forefront. Now for my weekly rankings for FBS college football. Remember there are two (2) types of rankings, PMT for the Professional Model Theory and the PMT+ which is the Professional Model Theory plus other categorical variables. The rankings below are from my statistcal analysis and data collection experience and expertise on college football ranking systems. The committee is getting more and more predictible by the week. Interesting that I can prepare a CFP Prediction Rankings in less time that the actual committee takes in deliberating how to rank the CFP Top 25. Last week in comparison to the CFP Top 25 and my predictions, again I was 96% accruate in selecting the pool of 25. I had Mississippi in the CFP Top 25 and the inexperienced committee selected Wisconsin. As for placement accruacy, I was 32% accurate. That’s up 400% from the first weeks rankings with many of the ranked FBS teams off by one spot. Either I had a ranked FBS team higher or lower by one position difference. Let’s see how I do this week in the prediction of the CFP Top 25. The final weeks of the season are going to be crazy and more crazier as the final week approaches. FBS teams that you thought would win struggle and lose, fail to play to their potetnial and escape with a win or lose all together on last series by opponents. What will this week bring in college football? It seems with 2 or 3 games left in the season, depending on which FBS program and conference you are in, the excitement is just beginning. As for one of the higher ranked FBS programs in the CFP poll, they have a simple week this week. More specifically the Southeastern Conference (SEC) or who I call the Schedule Easy Conference. This week #2 rankes Alabama and in my rankings #11 Alabama scheduled an FCS game at HOME versus Charleston Southern. Research tells me that Alabama will win by 4+ posessions, meaning 28 points or more. But would it not be apprapoah if FCS Charleston Southern pulled the late season FCS upset over Alabama and put the crowning moments on the SEC’s chances of being selected as one of the four in the CFP playoffs. Oh wait, it would have to take more than that for the SEC to be left out of the field of four, since the chair of the CFP is SEC Athletic Director from Arkansas; Jeff Long. In addition to, the founding fathers of the BCS and CFP are all SEC related. Guess we will find out when Auburn and Florida State put a monkey wrench in to the whole process at the end of the season over Thanksgiving weekend, by giving Florida and Alabama their second loss and all SEC programs possessing at least 2-losses or more. Now for my prediction on how the CFP Committee will rank the FBS prorgams one (1) through twenty-five (25) this week. I do believe that I have probably increased my placement accuracy this week. I do believe I might have 50% or greater this week in placement accuracy. We shall see. See the CFP Committees job is not that hard. I can do it without needing three (3) days to debate and argue. However, I woul rank differently as you can see by how I rank. With the last few weeks of college football remaining, the rankings are starting to stablize. Many top ranked teams either just surviving or playing hard enough to win the game. Did not Coach Jim Valvano say it best “Survive and advance”. The final weeks will determine who will make my field of sixteen (16) and which FBS teams will make the final four (4) for $50 Million dollars on the CFP table. As the college footbal season un-ravels, we now know that the pre-season rankings from the so called “experts” were wrong about the Southeastern Conference (SEC). The SEC seems to be leveling off and becoming not as dominant as they once were or ever were. If I recall did not the so called “experts” rank seven (7) SEC teams in the Top 25 in the pre-season, but but now we are down to two (2) maybe three (3) in the Top 25. I believe I saw crystal balls for sale from ESPN and their group of experts on EBAY and Craigslist; selling thier crystal balls that predicts accuracy and winners. Oh that’s the Future Prediction Indicator (FP)I model they created. I guess that’s why the coaches and athletes play the games versus relying on prediction models that are suppose to tell the college football fans who will win. I wonder what was the FPI rating was for LSU winning versus Arkansas yesterday from ESPN’s FPI model. How did that game turn out. I believe Arkansas won 31-14. Oh, the SEC only has two (2) 1-loss teams left. Maybe ESPN should just stick to reporting the games and leave the analysis to real experts. Stop trying to play the role of Karnak. A Baylor loss dropped them from the group of 0-loss programs, which now leaves us with five (5) 0-loss programs. Ohio State (10-0) has Michigan State (9-1) and Michigan(8-2) left, Clemson has Wake Forest (3-7) and South Carolina (3-7) left, Iowa has Purdue (2-8) and Nebraska (5-6) left, Oklahoma State has Baylor (9-1) and Oklahoma (9-1) left, Houston has Connecticut (5-5) and Navy (8-1) left. Which of these five (5) 0-loss teams will survive? That means we have four (4) from the Power 5 Conferences and one (1) from the Group of Five Conerences. So if Houston is the only remaining 0-loss team left, are they in? They should be but the bias CFP committee will leave them out. Can you say breach of the Sherman Act of 1890. My insticts tell me that Ohio State and Oklahoma State will lose one (1) of thier remaning games. My insticts also tell me that both Florida (9-1) and Alabama (9-1) will both lose thier final game of the season with Florida State and Auburn. That would mean the SEC would all have teams with 2-losses or greater and should be left out of the CFP discussion. This weeks rankings show that that the top five (5) stayed in the same ranking position and Notre Dame moved up one (1) with the Baylor loss to Oklahoma State. Losses in my rankings are more severe than rankings used by the subjective voters for the USA Today Amway Coches polls and the AP Poll. I use the professional model theory plus other categorical variables that create a more valid ranking based upon results, not an eye test. Within my rankings, there are (16) FBS teams that represent the Power 5 Conferences and (9) that represent the Group of 5 Conferences. Intersting how the Group of Five still do not get the recognition they deserve. Below are my rankings this week for college football. With the “down the stretch” weeks of college football remaining, the excitement and importance of each final game becomes increasingly important with $50 Million dollars on the table. Who will survive and advance.